In most of real growing networks the mean number of connections per vertex increases with time. Among the examples of large networks presenting this type of growth are the Internet, the Word Wide Web, collaborations networks, and many others. We call this type of growth accelerated growth. 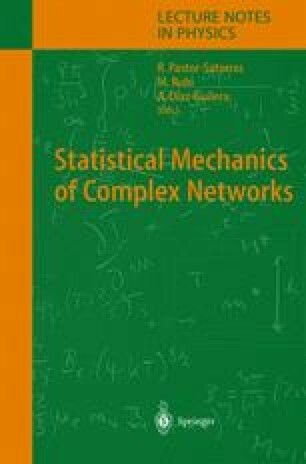 We show that the accelerated growth influences the distribution of connections and as consequence it may determine the structure of a network. For the growing networks with preferential linking and increasing density of links, two scenarios are possible. In one of them, the value of the exponent γ of the connectivity distribution P(q,t)∝ q-γ is between 3/2 and 2. In the other the exponent is, γ > 2, and the distribution is necessarily non-stationary. We discuss the general consequences of the acceleration and demonstrate its features applying it to simple illustrating examples. In particular, we show that the accelerated growth fairly well explains the structure of the Word Web (the network of interacting words of human language).